Kurtosis is a measure of whether the data are heavy-tailed or light-tailed relative to a normal distribution. That is, data sets with high kurtosis tend to have heavy tails, or outliers. Data sets with low kurtosis tend to have light tails, or lack of outliers. In effect, Kurtosis explains whether the samples concentrate too much at the centre or not. 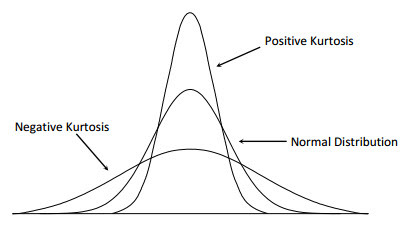 A kurtosis value near 0 indicates that the data follow the normal distribution. If negative kurtosis, then the distribution has light tails. If positive kurtosis, then the distribution has heavier tails. Usually, the values for asymmetry and kurtosis between -2 and +2 are considered acceptable in order to prove normal univariate distribution. Kurtosis risk in finance. This concerns the likelihood of seeing an asset return much farther from the mean (e.g., five standard deviations) than is predicted form the usual normal model for returns. Power of tests on means. When there is high kurtosis, it has been documented that the power of tests on means is low. The reason this occurs is because with high kurtosis, there are outliers, and outliers create greater variability in the estimated averages, as with estimated variances. It is often recommended to use robust procedures in these cases, such as tests on medians.